Gold-and-brown Rove Beetle (Ontholestes cingulatus): This beautiful beetle is one of our largest rove beetles (at 19mm) and appears to be a rare find in Montana. They can be found across Canada and in the eastern and northwestern US. They are often found on dung, smaller carrion, decaying fungi, and in compost piles. 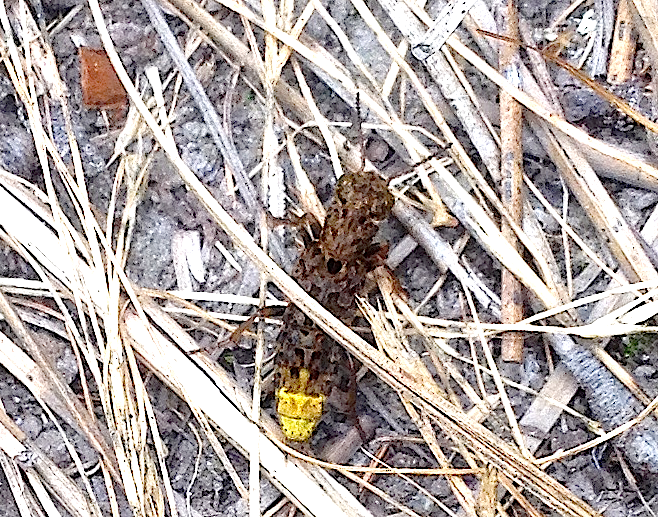 The yellow color on the last 3 abdominal segments (and underneath the thorax) comes from iridescent hairs. They will often carry the yellow tip of their abdomen upward when walking. Photo by Cedar Mathers-Winn on August 30, 2018 in the Bitterroot Valley.